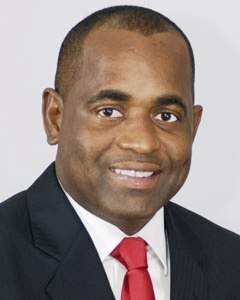 Roosevelt Skerrit (born 8 June 1972) is the Prime Minister of the Commonwealth of Dominica as well the Member of Parliament for the Vieille Case constituency. Regionally, he has served as the Chairman of the OECS. Roosevelt Skerrit was born on 8 June 1972 in Roseau Dominica. Skerrit attended the Portsmouth Secondary School before transferring to the Dominica Grammar School, where as high school senior he was elected 'head boy', President of the Student Council. He began his college education at New Mexico State University and transferred to the University of Mississippi, from where he graduated with a BA in English and Psychology. While at New Mexico State University he was also president of the Dominica Students Association. He was initially a member of the youth arm of the Dominica Freedom Party (DFP), the Young Freedom Movement, but became a member of the Dominica Labour Party (DLP) when he returned to Dominica from college. He was an English lecturer at the Clifton-Dupigny Community College until he was elected to parliament for the Vieille Case constituency in the February 2000 elections. He initially served as Minister of Sports and Youth Affairs, and upon the death of Roosevelt Douglas he was made minister of Education, Sports and Youth affairs. As Minister of Education, he established the Dominica State College. On the death of Pierre Charles on 6 January 2004 he was nominated to be the country's prime minister and was sworn on 8 January, aged 31.After becoming prime minister, he was elected as the political leader of the Dominica Labour Party. Skerrit is currently the youngest head of government in the world. In the 2005 General Elections he retained his seat by an even wider margin and his party gained one seat in the Parliament. His party won 12 seats in the parliament and 52% of the popular vote. The DLP defeated the Edison James-led opposition United Workers' Party who won 8 seats and 44% of the popular vote. Following the election, he assumed the ministerial portfolios of Finance, Planning, National Security and Overseas Nationals. In a cabinet reshuffle announced on 16 October 2007, Skerrit assumed the portfolios of Foreign Affairs and Social Security, while remaining in charge of Finance; he gave up the portfolios of National Security and Economic Planning, which he had previously held. He subsequently relinquished the Foreign Affairs portfolio on November 18, 2008, while again taking over the National Security portfolio. On 11 May 2013, Skerrit, married his long time sweetheart, Melissa Poponne at the Bourne Roman Catholic Church. He is the father of one son.